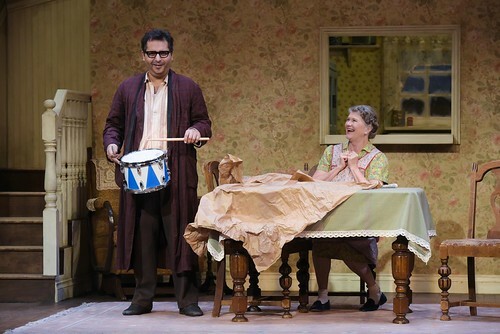 There’s a lot to love about American Conservatory Theater’s The Birthday Party, a funny, slightly freaky Harold Pinter. The cast is uniformly strong, director Carey Perloff (essaying her last directorial effort as ACT’s artistic director) deftly balances the unease and the humor. But for me, the joy, the electrical charge, the bright light of the production is Judith Ivey. She’s slightly daffy as Meg, who runs a boarding house with her laconic husband (Dan Hiatt), but she comes to life in the presence of her sole boarder (Firdous Bamji), with whom she has a flirtatious/motherly relationship. She’s also the life of a birthday party that shouldn’t be happening. And she’s not someone you want making your breakfast. Ivey is such an absolute delight she elevates the entire production. I reviewed The Birthday Party for TheaterMania.com. Here’s an excerpt. The play’s sense of imminent threat gives it (sadly) a timeless feeling. Ball’s set and Candice Donnelly’s prosaic costumes feel neither current nor specifically dated. This is a world of contrasts, and Perloff’s finely tuned production makes the most of this. There’s a feeling of the past built into the walls of the boarding house (heightened by Robert Hand’s stark lighting design), and yet everything feels of the moment, a big laugh will be followed by a chill, and a goofy interplay will suddenly turn threatening and deeply serious. Harold Pinter’s The Birthday Party continues through Feb. 4 at the Geary Theatre, 415 Geary St., San Francisco. Tickets are $15-$110. Call 415-749-2228 or visit www.act-sf.org.